This is Part 2 of a long essay that originally appeared in The Virginia Quarterly. (Read Part 1.) 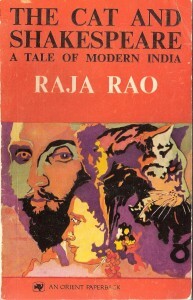 It focuses on Raja Rao, one of India’s greatest writers, arguing that his three major novels (Kanthapura, The Serpent and the Rope, and The Cat and Shakespeare) parallel the three stages of Vedic enlightenment—myth, philosophy, and perception—and that these three also progressively empowered the Indian Revolution. More detail and comment at the end of this post. I am not telling a story here, I am writing the sad and uneven chronicle of a life, my life, with no art or decoration, but with the “objectivity,” the discipline of the “historical sciences,” for by taste and tradition I am only an historian.
. . . and there is not even a tear in his eye, for who can weep? Why weep and for so many dead—what little circles like some flowers, and there is not even a tear in his eye, for who can weep? Why weep and for so many dead—what would happen to this poor Brahma Bhatta or Virupaksha Bhatta if our fathers did not die, and we did not have to take their ashes to Benares? Death and birth are meteorological happenings: we reap and we sow, we plant and we put manure; we smile when the sky shows rain, we suffer when it rains hail— and all ends in our stomach. There must be a way out, Lord; a way out of this circle of life: rain, sunshine, autumn, snow, heat and the rain once more, in gentle flower-like ripples on the Ganges. The rhythms and images of this passage circle, creating a stylistic counterpart to the circle in which Rama feels trapped. But there are two ways out, two ways to give up the world; and, as one might suspect, they are the ways of the West and East, Saint and Sage.
. . . must become saintly, must cultivate humility, because he knows he could be big, great, heroic and personal, an emperor with a statue and a pediment. . . . The Cathar, the Saint, wants to transform the world in his image—he the supreme anarchist. The Sage knows the world is but perception; he is King, he, Krishna the King of Kings. The moral universe insists—whether it be according to Newton or Pascal—on the reality of the external world. That dhira (hero) of whom the Upanishads speak, enters into himself and knows he has never gone anywhere. There is nowhere to go, where there is no whereness. Alas, that is the beautiful Truth and man must learn it—beautiful it is, because you see yourself true.
. . . at first I thought a second name for Krishna would be Ulysses. How I rounded the names on my tongue: Krishna Ulysses Ramaswamy. Absurd, absurd, said something to me, but I repeated them so often together that with familiarity it might become natural. No, the name seemed so absurd. The child is named Pierrot and, like their first child, dies within weeks. Pierrot’s death sparks Madeleine’s efforts at rejecting—not giving up—the world. She remains the dualist, the Cathar. In the growing intensity of her dedication to teaching history, people sense the heroic. She becomes obssessed with Buddhism, drives herself in pursuit of saintliness, and naturally drifts further apart from Rama. Near the end of the book Rama goes to visit her. “Why did you come?” she asks. “To see you.” “You cannot see anything but the eighteen aggregates.” She goes back to counting her beads, and Rama says to himself as he leaves, “. . .she parodied herself out of existence.” It is a weird, pathetically comic close to a marriage whose ups and downs, and intense happinesses and sorrows we so long been following. Sometimes singing some chant of Sankara, I burst into sobs. Grandfather Kittanna used to say that sometimes the longing for God becomes so great, so acute, you weep and that weeping has no name. Do I long for God? God is an object and I cannot long for him. . . . No, not a God but a Guru is what I need. He returns to India hoping to still the wavering of his soul over Madeleine, over the Cathars, over the multitude of people and issues his life touches. To integrate India into history—is like trying to marry Madeleine. It may be sincere, but it is not history. History, if anything, is the acceptance of human sincerity. But Truth transcends sincerity; Truth is in sincerity and in insincerity— beyond both. And that again is India. Rama becomes free—philosophically. To transform philosophy into realization, into pure, intuitive vision, he seeks a guru. What a will-o’-the-wisp of a wall it is, going from nowhere to nowhere; tile-covered, bulging, and obstreperous, it seems like the sound heard and not the word understood. It runs just a little above my window, half an inch higher, and on the other side it dips and rises, running about on its wild vicarious course. Ultimately the wall is only ahankara, the limitations of the ego, which keeps him from seeing what he sees he sees. “The definition of Truth is simple,” says Pai, “—you wake up and you are in front of Truth.” The book’s plot is so tenuous because Truth is finally more a matter of what is, not what happens. It is not action, but recognition. Ahankara, however, blocks recognition by leading one to try to fulfill the longing for Truth with things which are lesser than the Truth. (Pascal, one recalls, expressed the same notion—only using “God” for “Truth.”) Like Rama working on his dissertation, Ramakrishna Pai is involved in a project closely related to, but lesser than, his desire for freedom and Truth: he wants to build a three-story house. It is already there. You’ve just to look and see, look deep and see. Let the mother cat hold you by the neck. Suppose I were for a moment to show you the mother cat!” Govindan Nair never says anything indifferent. For him all gestures, all words have absolute meaning. “I meow-meow the dictionary, but my meaning is always one,” he used to assure me. Govindan Nair is Ramakrishna Pai’s guru, and for him the mother cat is symbol of Truth, of the Absolute. In one of the book’s most bizarre sequences, Nair’s office mates present him with a cat they have placed in a rat cage. It is a joke of metaphysical proportions, and there ensues a weird parody on Hamlet’s famous soliloquy. “To be or not to be. No, no,” says Govindan Nair. “A kitten sans cat, that is the question.” The vision shaped by tat tvam asi sees that the world is but the play—lila— of the Absolute. Kittens are cats—the diminuitive, playful aspect of cats, just as “To be” is the play of “Not to be,” or the serpent (the unreal) the play of the rope (the real). To choose, like Hamlet, is to affirm duality, to maintain the illusion that one is different from the other. To put a cat in a rat cage is to treat the Absolute like an object; and if the Absolute is an object, if it is not free, then there is no hope of freedom. “We have no feline instinct. We live like rats,” says Govindan in an atypical moment of despair. That is, we live as if we were objects. But on the whole Govindan Nair, like the book itself, exudes hope. In lovely accord with the concept of lila, The Cat and Shakespeare is a roguish, uproarious, but exceedingly gentle comedy which, despite its general abstruseness, strikes one with great warmth. “Life is so precious,” says Pai near the end of the book, “I ask you why does not one play?” Man, like a kitten, plays because he perceives himself to be lila, and no one perceives this more profoundly and compassionately than Govindan Nair. One comes to love him not only for his delightful, teasing language but also for the fearless freedom with which he lives. “You must have eyes to see,” he said desperately to me. “What do eyes see?” I asked, as if in fun. “Light,” he said, tears trickling from his dark eyes. I saw nose (not the nose) and eyes seeing eyes seeing. . . . I saw love yet knew not its name but heard it as sound, I saw truth not as fact but as ignition. . . . If I go on seeing a point, I become the point. This is the rhetoric of mystical illumination, Raja Rao’s prose straining to convey the point at which the self gives way to the Absolute. Finally, however, such passion to render that moment must result in silence; so when Raja Rao said he wanted to publish The Cat and Shakespeare, itself barely 100 pages long, with 300 blank pages at the end, he was jesting in earnest. The tears trickling from Govindan Nair’s eyes may serve to remind us that to jest in such a way or to fill one’s book with complex, often irreverent discussions on perception or causality is not merely to engage in merry abstruseness. We have not come as far from Kanthapura as it may seem, for the Truth that so deeply touches Govindan Nair is the same that caused Moorthy to say to Rangamma, “The fault of others is the fruit of one’s own disharmony.” The Cat and Shakespeare pulses with the very heartbeat of revolutionary India, for it is the most sophisticated extension to date of India as idea, as metaphysic. One may also sense in Govindan Nair’s fearlessly free style something of the courage that animated Sri Aurobindo, and Gandhi, and so many of those early strugglers for freedom. To know that the world is but one’s self seen as the other is to have, as Rama says, the courage “to dare annihilation.” The metaphysic of tat tvam asi assures us that one’s freedom is truly one’s own creation. It is not, however, in one’s hands: it is in one’s eyes—in vision. “The Saint and the Sage: The Fiction of Raja Rao” by Richard R. Guzman originally appeared in The Virginia Quarterly Review, 56:1 (Winter 1980), 32-50. It has been reprinted many times. The spiritual depth of India is undeniable and its relationship to the India Revolution strong, especially seen through the lens of this particular author. Yet I also do not mean to fall into an “Orientalist” trap by over-spiritualizing India. I am aware, for example, that perhaps the world’s largest body of work arguing for atheism and materialism is written in Sanskrit. Read ”World Writing: Raja Rao“—a short commentary and reminiscence. 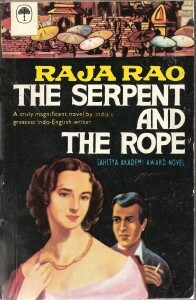 This entry was posted in World Writers and tagged Colonialism, Indian literature, Indian philosophy, Indian Revolution, Indian writing, Nationalism, Post-Colonial style, Raja Rao, Richard R. Guzman, The Cat and Shakespeare, The Serpent and the Rope, Vedanta, World Writers. Bookmark the permalink.